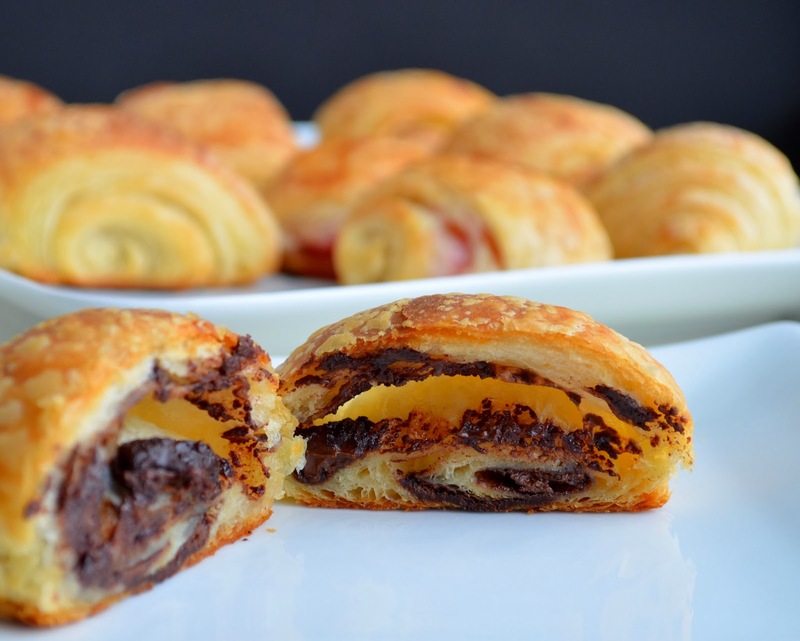 I know I've made croissants before, just chocolate ones, but I thought I would feature the recipe again with two more fillings. I also adjusted the amounts so it only makes 16 instead of 32. I would say "who needs 32 croissants" but really, it's hard to ever say that there are too many croissants that melt in my mouth as I eat them. For these I used Nestle Toll House dark chocolate chips, or freshly sliced strawberries, or Mexican-style shredded cheese and jalapenos. 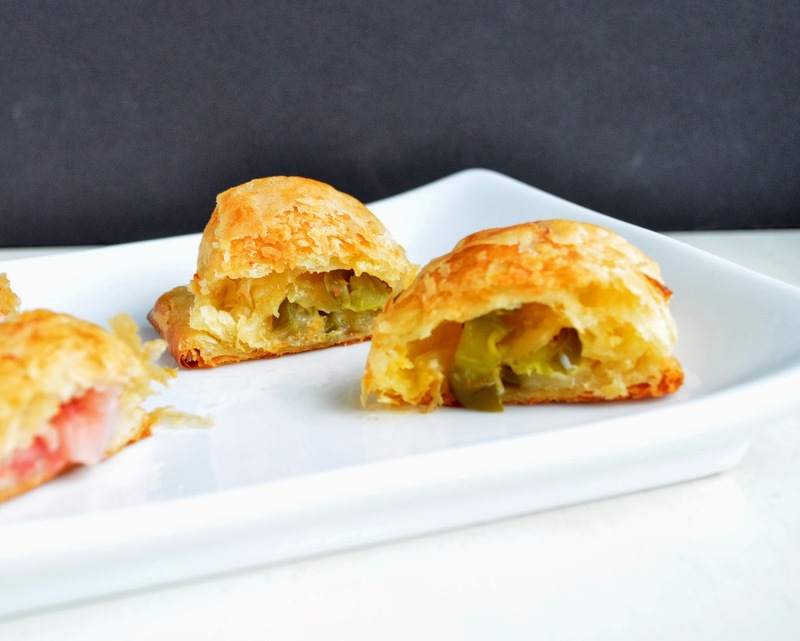 The cheesy jalapeno croissants are definitely my favorite of this batch. I loved the spicy, savory flavor combined with the fluffy but crunchy layers. 1. Stir together warm milk, brown sugar, and yeast in bowl of standing mixer and let stand until foamy, about 5 minutes. (If it doesn’t foam, discard and start over.) Add 1 ¾ cups flour and salt and mix with dough hook at low speed until dough is smooth and very soft, about 7 minutes. 3. After dough has chilled, arrange sticks of butter horizontally, their sides touching, on a work surface. Pound butter with a rolling pin to soften slightly (butter should be malleable but still cold). Scrape butter into a block and put on a kitchen towel, then cover with another towel. Pound and roll out on both sides until butter forms a uniform 8- by 5-inch rectangle. Chill, wrapped in towels, while rolling out dough. Roll out the dough on a lightly floured surface, dusting with flour as necessary, into an 18- by 10-inch rectangle. Brush off excess flour with pastry brush and trim edges with a pizza wheel or sharp knife. Cut dough horizontally, then vertically into 8 strips to make 16 rectangles. 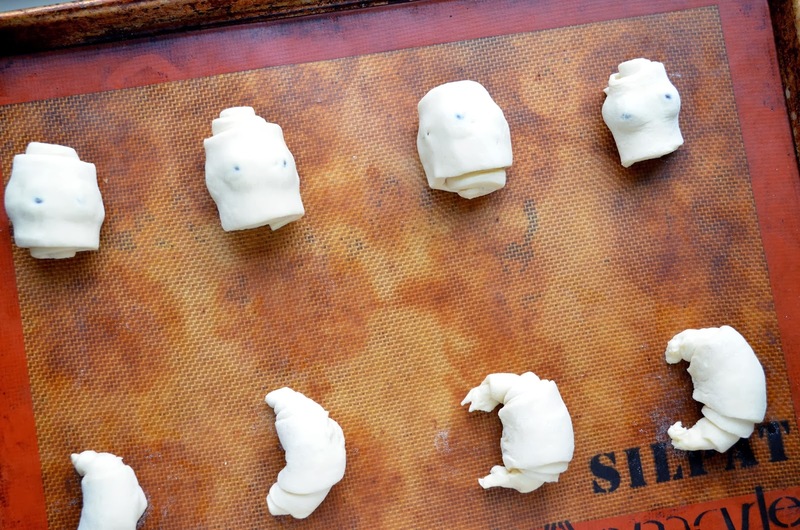 Stretch each piece of dough very gently on one side to create a triangle like shape. Place desired filling on the wider end of the triangle, or right down the middle of the rectangle. Roll gently, stretching slightly while rolling if necessary. Place, seam side down, on a parchment-lined large baking sheet. 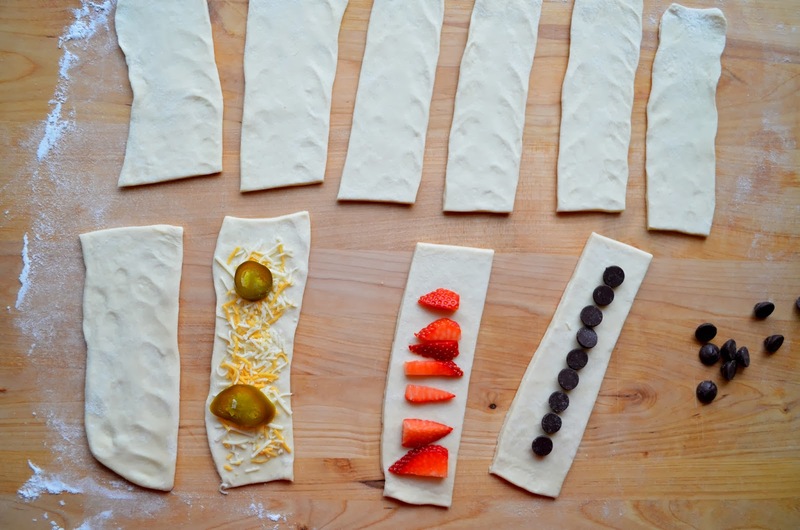 Make more pastries in same manner, arranging them 2 inches apart on baking sheets. 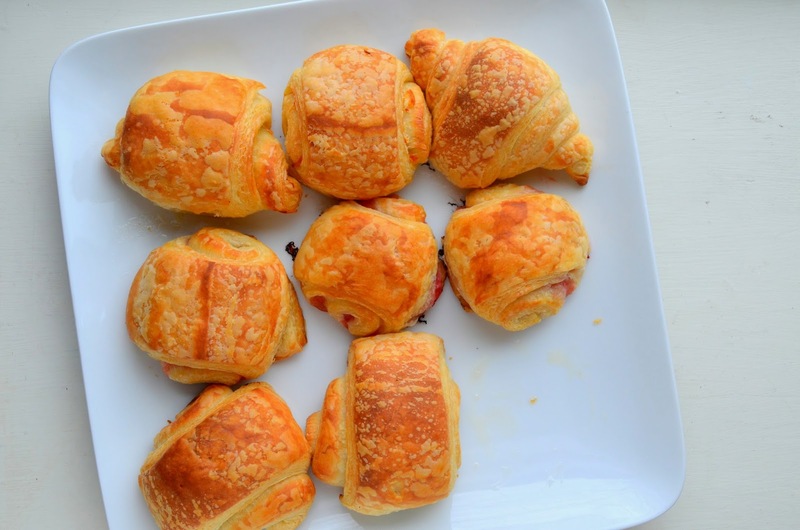 Cover croissants on the sheet pan lightly with a kitchen towel. Adjust oven racks to upper and lower thirds of oven and preheat to 425°F. Remove towels from on top of pans. Spritz inside oven generously with spray bottle and close door. 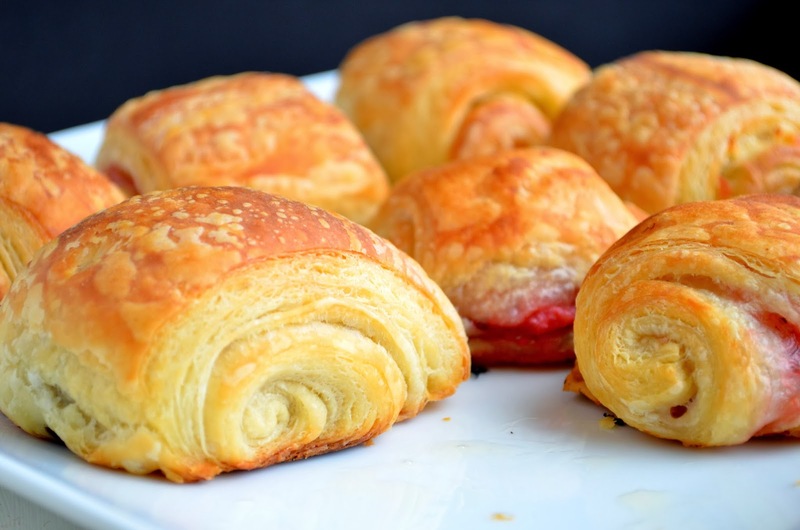 Put pastries in oven, then spritz again before closing door. Reduce temperature to 400°F and bake 10 minutes without opening door. Switch position of sheets in oven and rotate sheets 180°, then reduce temperature to 375°F and bake until pastries are deep golden, about 10 minutes more.